In an early confirmation of Rupert Sheldrake's theory of 'morphic resonance' I subsequently discovered a TV engineer in Australia who had recently moved "downunder" after a career in the BBC reportedly had exactly the same idea just a few months later (according to a cruel snippet I spotted in New Scientist 45 years ago). Then there was the time during the four and a half year term of penal servitude2 as a "thin sandwich" aeronautical engineering apprentice when I mildly suggested my employers might well make significant electricity savings by installing the new-fangled lower energy fluorescent lights that were just becoming available in the early 1970s. That one got rejected because, as I was assigned to the Quality Control department at the time, and as that department "ran" the suggestion scheme, I was automatically ineligible to make any suggestions. I also had to type the rejection letter for my boss to send to me! I'm amused to note there are now moves afoot to ban the manufacture of any other kind of light bulb! 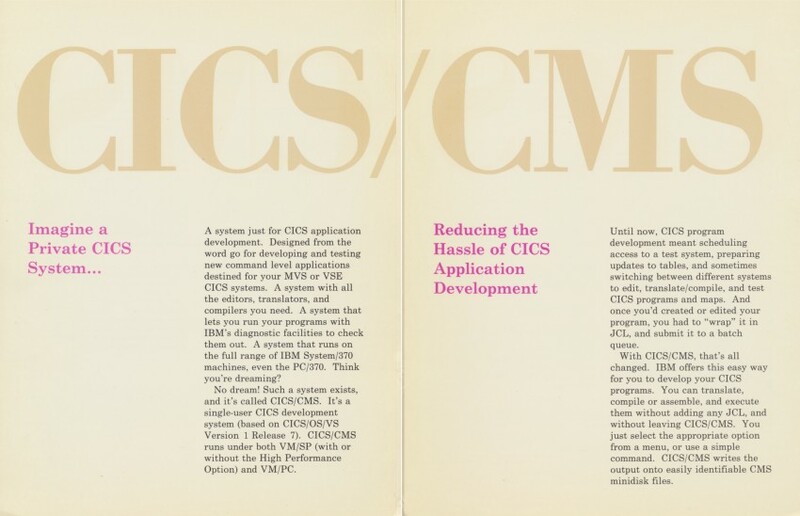 Let's not forget the time I suggested enclosing a copy or two of the CICS/CMS general information brochure I'd written with all CICS documentation libraries shipped out to the existing 20,000+ CICS licensees. This would, I felt sure, have helped spread the word and (just possibly) have stopped CICS/CMS becoming the black sheep of that remarkable family of products. It still amuses me to recall the bemusement in the voice of a newly-ex senior CICS Business planner (a year or so after that daft idea had been rejected) when he (or she) called me to ask why, in my opinion, product sales had been so very (very) far below plan. I guiltily confess I'd been waiting for just such a call, though I wasn't quite sure who would eventually get around to making it. Anyway, I mildly suggested to him (or her) that it might have been smarter to publicise the existence of CICS/CMS in its earliest days in the way I'd (officially) suggested. "That would've been a great idea!" was the gist of the reaction (with the expletives deleted) "Who on earth said 'No'?". I'm afraid the answer was one of his (or her) bosses. Notice how I'm suppressing names and other identifying characteristics quarter of a century later? Tee-hee. Ironically, text from my brochure was actually reproduced inside the recognition plaques handed out to us by the Lab director at the end of the project during a (necessarily) small-scale recognition and awards3 dinner. I still sometimes amuse myself by calculating how many times I could have cleared my mortgage on a mere 1% commission on extra sales. You have no idea how much grief I endured to keep the word "hassle" in the final copy text! 1 Different in some way, I could only presume, from the nausea induced by their emetic programmes. 2 Truncated after I'd picked up all the tertiary education certification I thought likely to come my way by switching to the computer industry in February 1974 (back when mainframes were still seen as the best thing since sliced bread). They still are, but that's another story.